Rachel Solemsaas was appointed chancellor at Hawaiʻi Community College in 2016. She previously served as the vice president for finance and administrative services at Truckee Meadows Community College in Nevada. Prior to that appointment, she was vice president for administrative services at Bellevue College and vice president for finance and operations at Edmonds Community College, both in Washington. With more than 27 years of progressive public service experience that includes 12 years at community colleges, she also served as a chief financial officer, finance director and principal accountant in Washington. 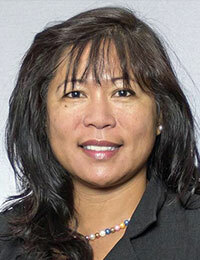 Presently, Solemsaas is president of the National Asian Pacific Islander Council, an affiliate council of the American Association of Community Colleges. Her leadership has guided Truckee Meadows Community College through a financial crisis and has established a budget development process that is participatory and transparent. Solemsaas has led her teams through major construction project completion, on budget and on time with unique financing options. Solemsaas earned a doctorate of education in higher education with emphasis on community college leadership from Washington State University and a master’s in public administration from the University of Washington. She earned a bachelor of science in accounting from De La Salle University in Manila.